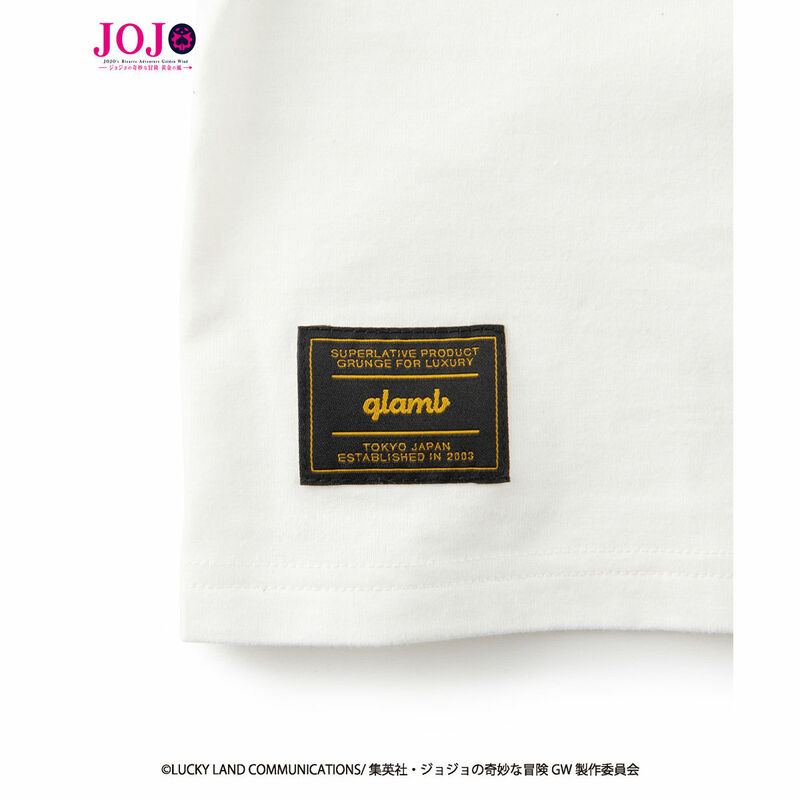 Presenting to the world: the second wave of collaboration T-shirts made by the team up between JoJo’s Bizarre Adventures: Golden Wind and glamb! This features art on T-shirts designed and inspired by the Stands of the six members of the Passione, as well as Polpo’s Stand, Shadow Sabbath. Color options include either black or white, while size options include 5 sizes from (XS) to (XL). Giorno’s Stand, Golden Wind, has the ability to endow anything it touches with life, and to transform both inorganic objects and living organisms into other things. In order to express this concept in concrete graphical art, precise pencil sketching and classical watercolor techniques were combined. This work of art depicts a Stand decorated with flowers and butterflies. Smooth, natural, and vibrant colors give off an aura that radiates the overwhelming energy of life. The character is placed in the center, facing directly forward. This composition is designed to create a strong impact, expressing the protagonist Giorno’s strong and unwavering will. Enjoy this elegant and gorgeous design, as well as the supple feel of the 40/2 T-cloth. With his manly actions and words, the team leader Bucciarati holds sway over, but is also loved by, both the members of his team and the local townsfolk. 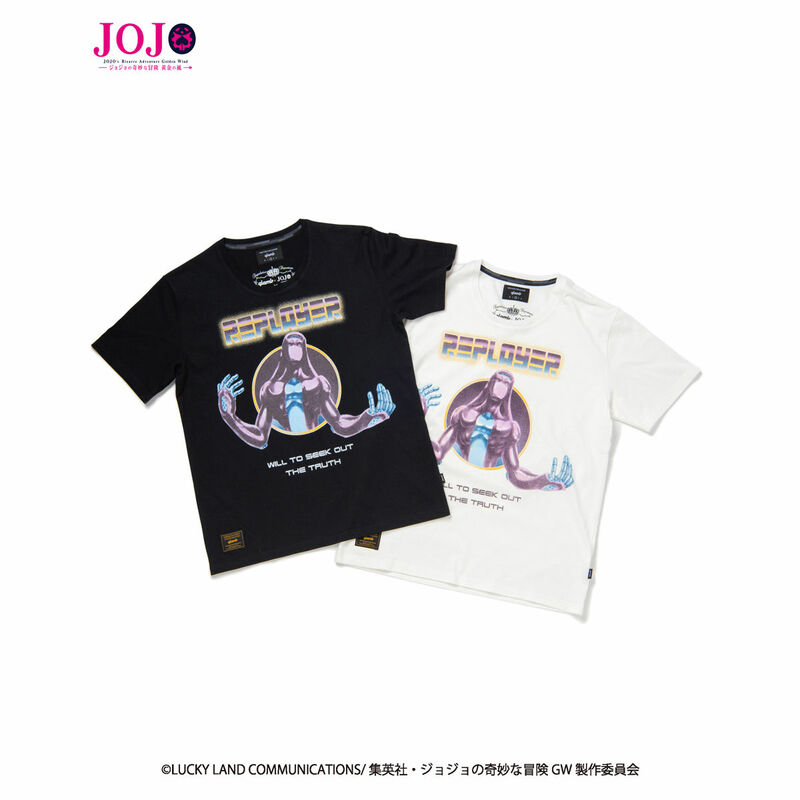 The base design of the art drawn on this 40/2 T-cloth shirt was based on the powerful and stylish way that Bucciarati carries himself, as well as record sleeves from UK rock music and art. The depiction of the character bursting out and appearing from within the zipper represents the ability of his Stand, Zipper Man. Also drawn on the shirt is his well-known phrase “Arrivederci”, along with his words that express his determination as a high-ranking member of Passione: “Are you ready for this? I know I am”. Both phrases were drawn on the shirt using stenciling, with the final touch of the name “Bruno Bucciarati” drawn on the shirt to add an animated street fashion feel to the work and raise it to an even higher dimension. 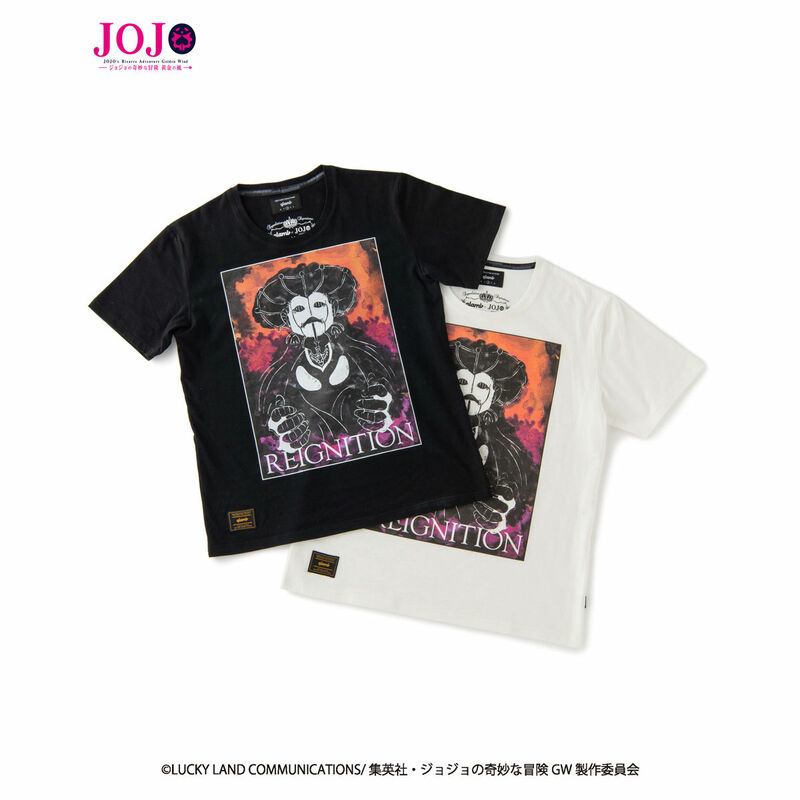 Leone’s Stand, Moody Jazz, has the special ability to reenact/replay past events, similar to how videos can be rewound and watched again. The physical form of the Stand is futuristic — almost as the Stand has adapted to fit the ability, expressed via a tinge of electropop and science fiction elements. These vintage elements mesh perfectly with the refined grace of the retro graphics. 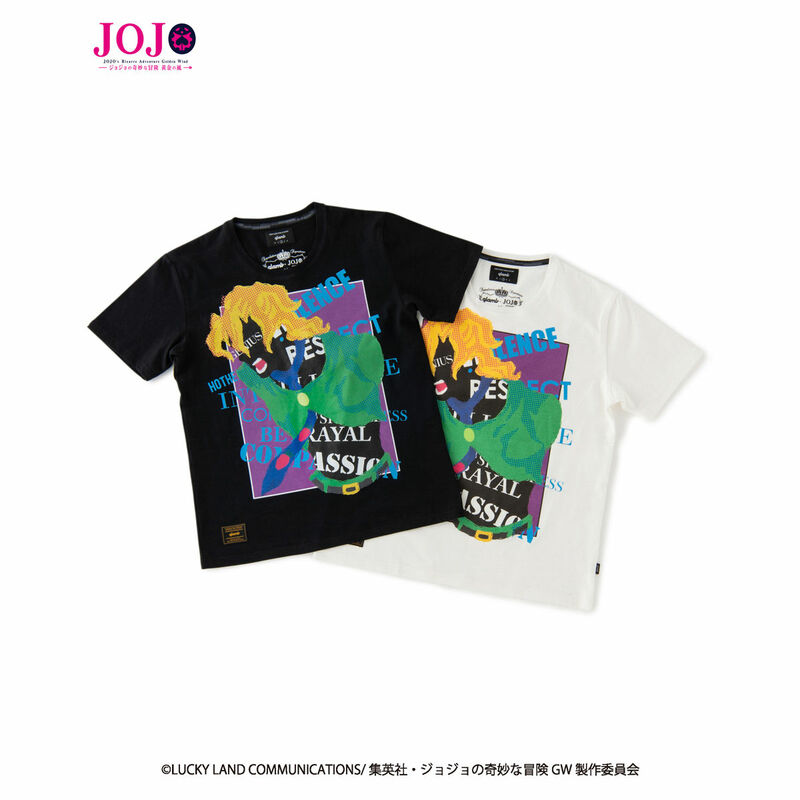 The material used to create this shirt is 40/2 T-cloth, which feels very comfortable on the skin; enjoy it while you luxuriate in the JoJo universe contained within the shirt. “The number 4 doesn't exist. 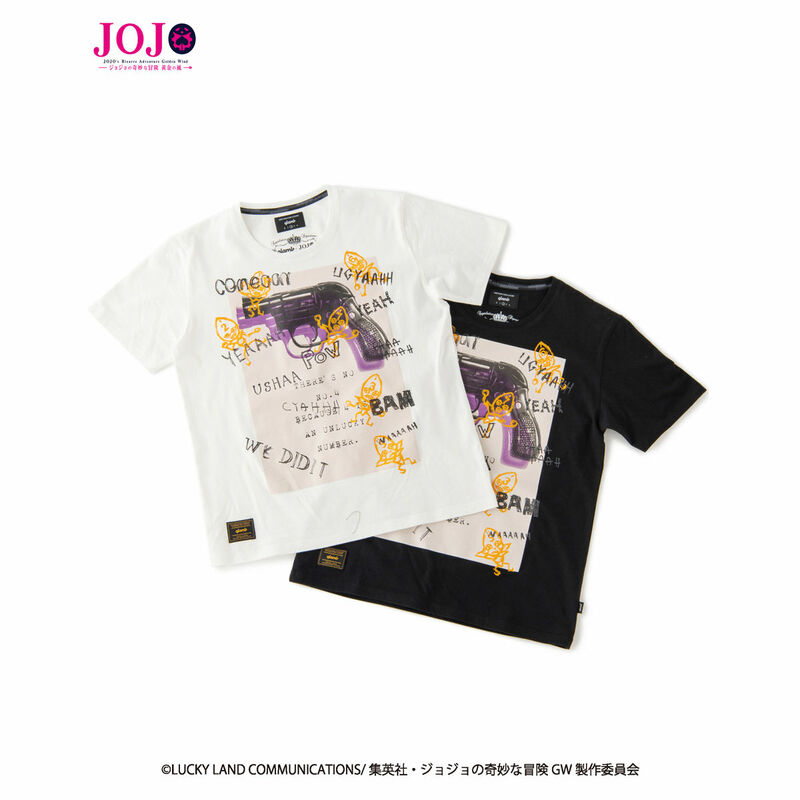 4's a unlucky number.” Words that symbolize Guido Mista’s core beliefs, printed along with pistols on the front of the shirt. With graphics that have a strong semblance to American pop art, scribbles of Guido’s Stand Six Bullets represent his catchy, innocent and aggressive character. This work of art was tailored out of supple and comfortable 40/2 T-cloth. Not restricted to any particular season, it works with many different styles. The illustration drawn on this shirt was based on 70s influences, such as mod and psychedelia subcultures. 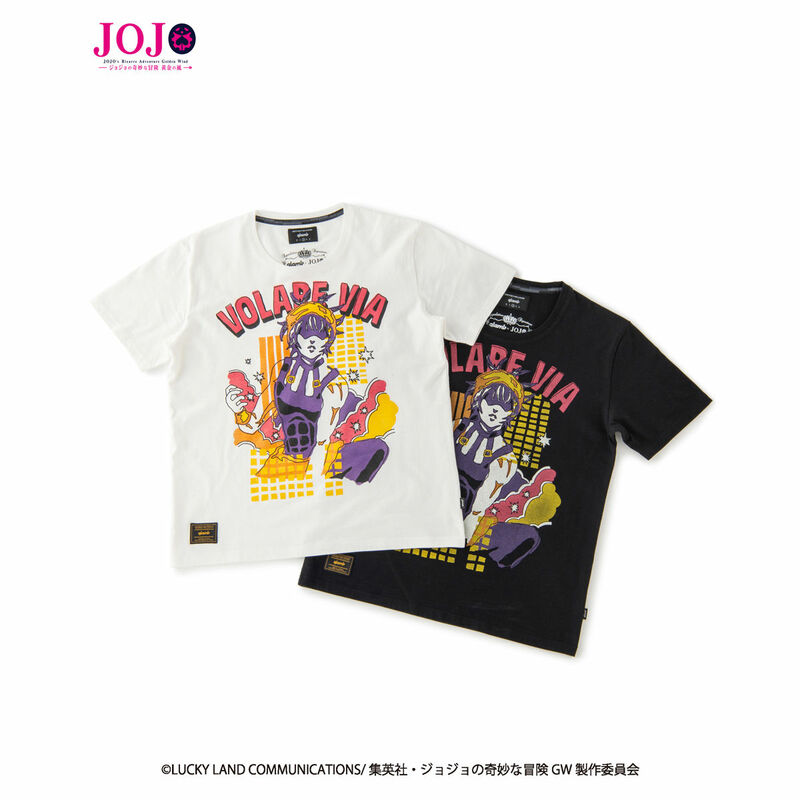 The key undertone of orange that adorned Narancia in the original works comes together with a very fashionable outfit to express the character elements of enjoying music and dancing. 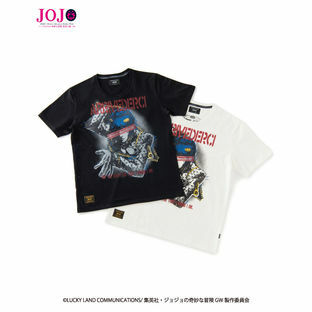 The muzzle flashes and smokescreen on the back represent the attacks of his Stand, Li’l Bomber . Inscribed on the chest of the shirt is his signature phrase “Volare Via”, which perfectly completes this iconic design. Enjoy the textile feel of the 40/2 T-cloth used, as well as the rhythmic graphics on the shirt. The intelligence of a refined gentleman, combined with the ferociousness of a beast hidden deep within. This design was based on Pannacotta Fugo’s complex inner personality, clean mid-century modern poster design illustrations, and the techniques of typography. A face painted pitch black with no eyes and the many different words piercing the body represent a lack of self-control, and a resulting volatile nature. The color in the name of the Stand itself, Purple Smoke, is the same color used to cover the background, almost as if engulfing the canvas of a painting. This ends up creating a final product that falls within the bounds of contemporary art. 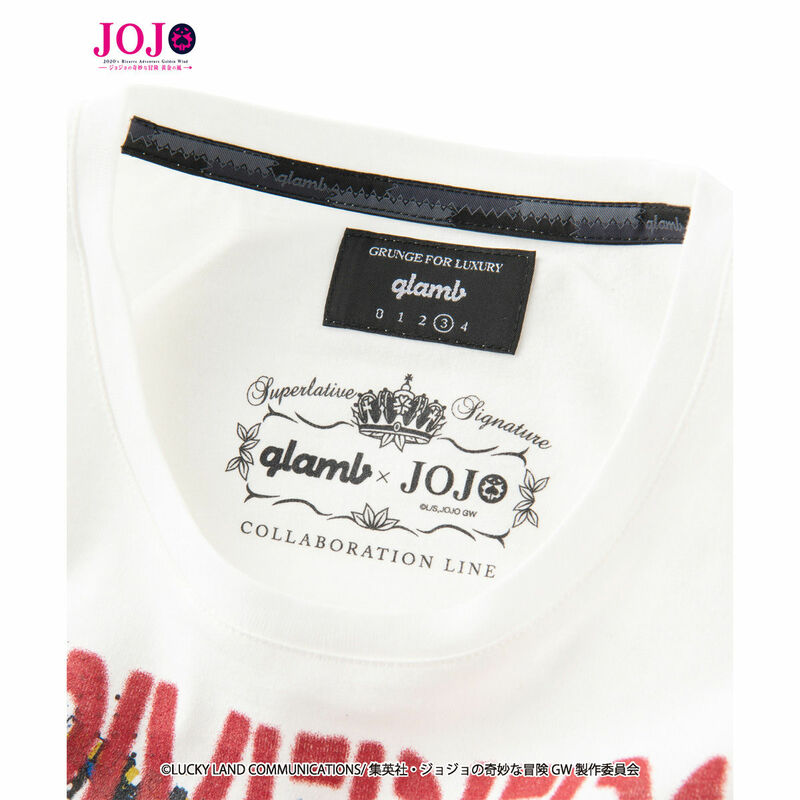 The textile used in this shirt is our preferred 40/2 T-cloth. With an ample supple feel to it, this shirt is guaranteed to bring a joyful resolution to the daily struggle of choosing what to wear. Shadow Sabbath is Polpo’s automated Stand that indiscriminately attacks whoever extinguishes the flame of the lighter and relights it. The illustration of this fearsome pursuer in the shadows was drawn based on the approach to art known as aestheticism. From an eerie flame rises the uncanny figure of the Stand. This composition was used in order to emphasize the massive amount of energy that the Stand exerts. 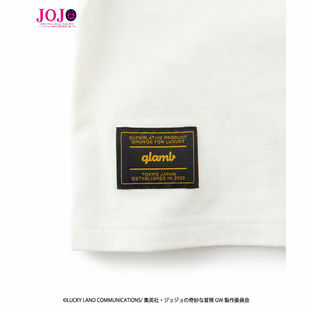 At the same time, it also exerts an aura of elegance, all contained within the 40/2 T-cloth.